Like all young-20-somethings, I love a great find at a great (cheap!) price. From a 60% off sale at Loft, to my $1,200 Ralph Lauren lamp look-alike (find at Target), there is nothing better than finding a designer look for less. Decorating my home has been a priority to me. It’s something that makes me creatively happy. Each time I get a Z-Gallerie or CB2 catelog in the mail, each time I walk into Target, and each and every time I get to tour a design-savvy friends’ home, I drool. Most my age will pick up furniture from Ikea or Target at a price that is affordable on a $30k budget. While these pieces are great (and can be DIY-ed! ), these major stores are missing a key element in good design: uniqueness. And for uniqueness, you have to think outside the box. You have to thrift shop. 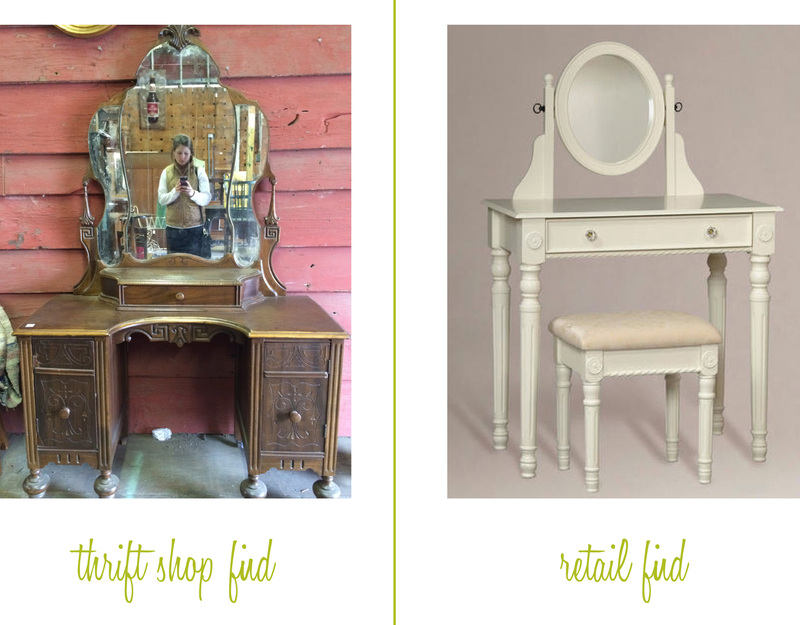 Thrifted pieces can become designer look-alikes – you just have to know how to find them. A little bit of background on my home: half of it came from out of the box places. My gold bamboo side table was an antique from my mom. My navy trellis-pattern chairs and orange-drawer side table came from my dad’s office (where they suffered through ugly maroon upholstery and shiny mahongony stain). My 5-foot long, industrial desk was a Craigslist find. Look everywhere from thrift shops, consignment stores, or garage/estate sales in wealthier neighborhoods. Think outside the box. A long and low dresser can be a tv stand. A baby changing station would make a great bar cart. See past the ugly. Remove the hideous lamp shade. Take away the paint splatter. Polish the dusty. Look for timeless shape and lines. Think: your old childhood dresser. 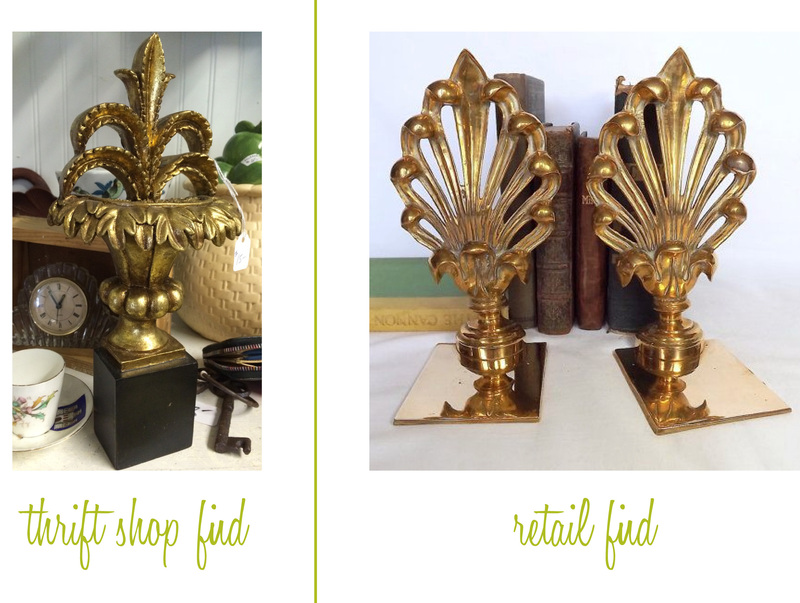 Magazines are updating these pieces with metallic lacquer or chalk paint. Look for name brands. Think: Lane furniture – a great brand that makes for the perfect DIY. Bamboo and rattan are always classics, but often overlooked. Think: classic outdoor furniture or Asian-inspired pieces. Update a bamboo chair in a neutral paint color for a timeless look or try a bright orange with a funky patterned cushion for something more trendy. I love how Society Social styles their bamboo chairs. Sometimes it’s a matter of accessorizing. Replace the hardware on a mid-century classic to update a tired look. Timeless lines will get you there. I love this side table for three reasons. It has a glass top, it has unique double-legs, and it’s hardware is original. I’m not a huge fan of the white, so I would style it one of two ways. 1. I’d spray paint the entire thing (minus the glass) or 2., if it can be disassembled, I’d only spray paint the white pieces and polish the existing metal. Compare to the West Elm find on the right. This is a great example of Rule #2: See past the ugly. My junior year of college, I moved into this amazing industrial apartment: high ceilings, brick walls, exposed beams and pipes. I wish I had a faux fireplace to display in there. I love this Pinterest find in hot pink and this classic black fireplace from Lonny Magazine. Add candles or a fireplace screen to polish off the opening. I walked by this lamp three times before taking the time to check it out. It was having severe She’s All That syndrome with no Freddy Prince Junior to save it. Once I took off the oversize lampshade, I truly loved the piece. Not only is it real marble, but it’s vintage and has two bulb sources. I would pair this lamp with shorter, rectangular shade like my retail find from Society Social. These classic side tables were a dime a dozen at the thrift store. All they need is a little paint and perhaps some killer Anthropologie knobs. Since both of these side tables offer storage, I love using them as a night stand or a mini-bar! Compare them to these (kind of plain Jane – am I allowed to say that?) $300 West Elm night stands. The Pinterest world has embedded into everyone’s brains: you need a trunk. Use it for at your bed’s end, as foyer bench, as a coffee table – the possibility are oh-so endless. Trunks are an old-time classic and can be found in almost any thrift store. Compare them to this Pottery Barn trunk I found online or this painted vintage trunk detailed with a patterned cushion. I love this piece of furniture. It’s a perfect example of Rule #4. Lane is a furniture brand that has been around… forever. Most of their original pieces are now found in thrift shops. They are great quality, but won’t be as overpriced as some of the more exclusive vintage brands. I would love to get my hands on this piece and turn it into a bar like Lonny Magazine did on the right! A touch of paint (maybe vertical ombre stripes, if you’re up to it) and some new hardware should do the trick! I’m so glad this was on hold for an estate sale or I would have bought it. I love the look of this secretary. My desk needs (a large iMac, sketchbooks, and a large calendar of blog post ideas) are a little overloaded for this small secretary, so I’d use it one of two ways. Idea #1 would be a vanity. It could provide extra drawer storage in a bedroom, and could display make up brushes and jewelry quite nicely. 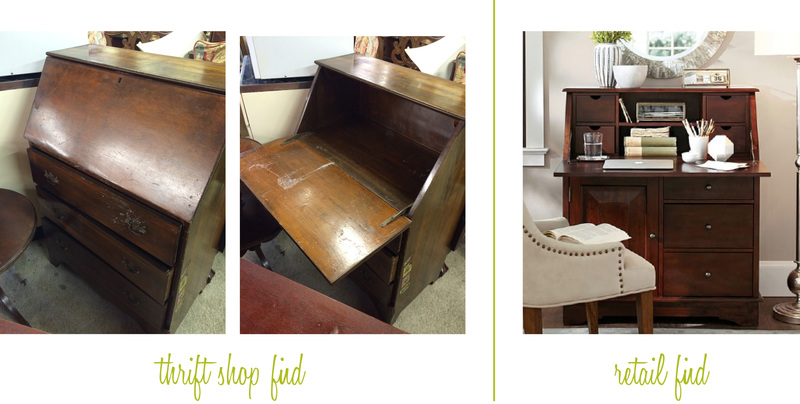 Close the hinged desk when you have guests over to hide clutter. Idea #2 would be, you guessed it, a bar. Open the hinge while entertaining to display drink selections and to have a surface for cocktail mixing. Compare to this Pottery Barn find. This last piece is probably the most intimidating. 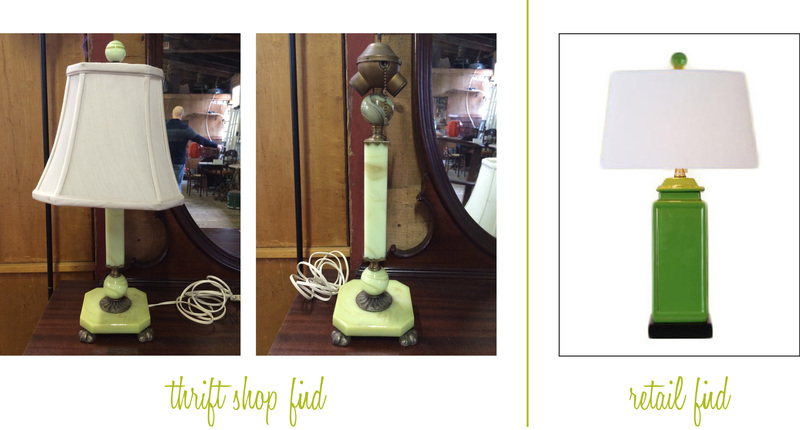 This vintage vanity is all decked out: curved mirror, greek-key carvings, and oversized feet. It requires a certain taste, but it’s definitely unique. There are a couple of ways you could spin this reno: 1. Add polish to freshen it up. 2. Paint. You could go with a neutrual color, but in my opinion, a piece like this is a wow factor. I’d go with a silver lacquer and add feminine accessories. 3. If the mirror is removable, I’d separate the pieces and use it as a desk. No offense to my World Market comparison, but how much cooler is this thrift find?! My last note for thrifting-newbies: Always remember that a stain or finish can be changed, hardware can be removed, and a pop of color never killed anyone.